CC is currently seeking artists whose work reflects an interest in topics related to food justice, public policy advocacy, farming and gardening, race and class awareness, access, and nutrition education. Food security is among the most basic of human needs, but contemporary issues preventing equitable access to food are extremely complex. Economic inequality and structural racism, corporate agricultural practices, food waste, climate change, and domestic and geopolitics are among the many factors that contribute to the growing disparity in the distribution of food resources across the US and around the globe. 521,750 Pennsylvania children and nearly 1 in 7 of our neighbors in Pittsburgh’s Allegheny County are “food insecure,” lacking reliable access to a sufficient quantity of affordable, nutritious food. Food Justice: Growing a Healthier Community through Art, and related interpretive programming, will convey personal stories and experiences to demonstrate the local and world-wide impact food justice has on individuals and society, and how the arts can guide thoughtful conversation on the topic. MEDIA CRITERIA The exhibition will highlight a variety of techniques and forms including, but not limited to, innovative art expressions rooted in traditional craft media such as clay, fiber, glass, metal, wood, and found objects; and will explore unexpected relationships between craft and painting, sculpture, conceptual, and installation art. ELIGIBILITY Open to exceptionally talented artists who are in the early, mid or late stages of their career and reside in the United States or abroad. Artists must work in craft media: ceramics, wood, metal/jewelry, glass, found materials, mixed media, fiber or a combination of these materials. The application will ask for: • Contact information • Artist statement • CV/ Resume in doc and pdf format (file size must be under 1MB) • 6 Representative images similar in quality and nature to the work the artist would enter if selected. o Images need not be the exact pieces the artist intends to enter. o Quality of images submitted may influence decisions on inclusion. o Each uploaded image descriptions must include Title, Year, Medium, Dimension, Retail Price. If you have any questions about the Food Justice artist open call, please contact Kate Lydon at klydon@contemporarycraft.org. SALES CC receives a 50% commission on artworks sold. Commissions received through CC sales help support the free admission, education and community outreach programs of the nonprofit organization. RIGHT TO REPRODUCE CC reserves the right to photograph exhibited work, and use photographs – or the artist’s entry images – in both printed and electronic materials for publicity and promotion. FOOD JUSTICE CALENDAR ● Call for Artists begins – July 26, 2018 ● Deadline for Entries – December 7, 2018 ● Notification of Artists – February 15, 2019 ● Exhibition dates – September 13, 2019 through March 20, 2020 Questions? Please contact Kate Lydon at klydon@contemporarycraft.org. Touchstone Gallery in Washington DC is seeking entries for “ART OF ENGAGEMENT,” a National Juried Show scheduled for August 4 – 24, 2017. Artwork entries should reflect present-day issues and concerns. Be part of a national conversation about important issues using the universal language of art. Be bold, stand up, and speak out! Be an #artist and an #activist. 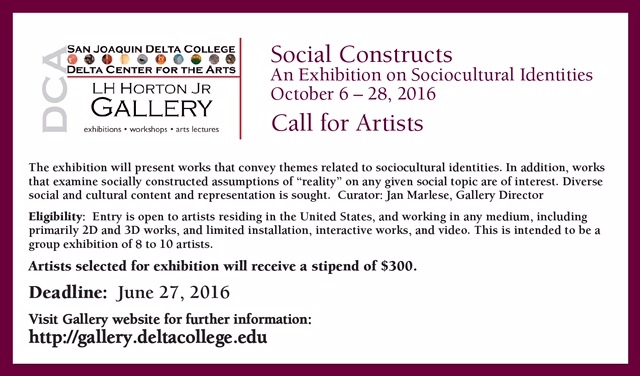 Open to all artists living and/or working in the United States, 18-years-old and older. All original visual media that is the artist’s own concept, design and work. AWARDS 1st Prize: $750, 2nd Prize: $500, 3rd Prize: $250. Please visit www.touchstonegallery.com/call to apply. Deadline to apply: June 12, 2017. Motivated by the writings of longtime Craft Horizons magazine editor Rose Slivka and artist/poet M.C. Richards, The Center for Craft, Creativity & Design (CCCD) presents a challenge for makers and writers: to create a new collaborative work inspired by The Good Making of Good Things: Craft Horizons Magazine, 1941-1979 in just 11 days. Phase One, April 15, 2-4 pm: convene makers and writers, introduce and tour exhibition, engage in a collaborative, playful workshop, and assign teams. Phase Two: teams will have 11 days to refine, develop and materialize a final collaborative work. Phase Three, April 28, 6:30–8pm: teams will present the final work during a public event at CCCD. Full Call for Proposal available HERE. Please click HERE to submit proposals by April 7, 2017. This all-media exhibition invites national and international artists to submit interactive works. Visitors will be encouraged to touch and engage with the artwork, so all work must be safe to touch. Our juror is Virginia-based artist and curator, Cynthia Connolly.